Jean-Marc Gales: "We'd do an SUV that is very light, very fast on the track and has outstanding handling." GENEVA (Reuters) -- As car industry leaders gathered in Geneva this week to fret about how to cram more software and electronics into their vehicles, one man stood out. 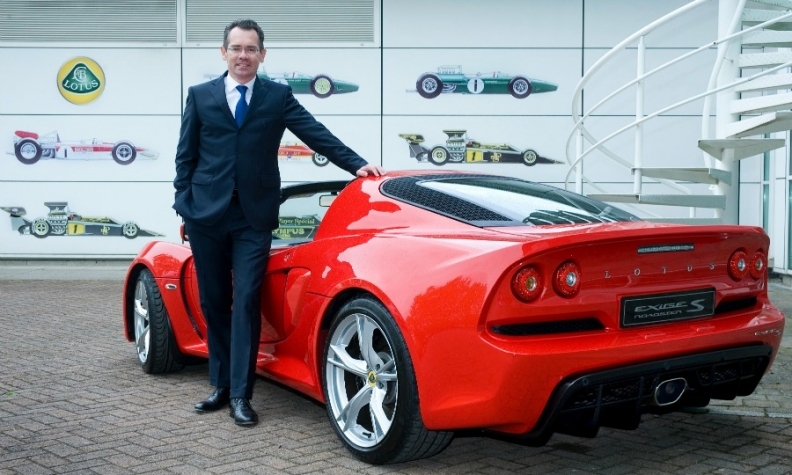 Group Lotus boss Jean-Marc Gales is not preoccupied by the future of self-driving cars, since his customers have no intention of giving up the wheel -- and because the loss-making British sports car maker's survival is a more imminent concern. While defiantly analogue models like its newly upgraded Evora flagship may eventually get more digital controls, Gales said in an interview, the priority is a return to Lotus's lean essentials -- which means removing unnecessary gadgets. "We had an electronically opening glove box, which in a sports car is worse than useless," he said at the Geneva auto show, barely 10 months after joining Lotus as CEO. "I don't know who put that in, but I took it out." Other industry forces are harder to resist. The next all-new Lotus vehicle is likely to be a crossover SUV, Gales said. Now owned by Malaysia's Proton, a division of conglomerate DRB-HICOM, Lotus won renown for its aluminium chassis technology combining stiffness with low weight. It also developed the VH architecture used by a generation of Aston Martins. The carmaker, which lost 71 million pounds ($108 million) last fiscal year, may already be turning a corner under Gales, whose former roles include Volkswagen marketing chief and second-in-command at France's Peugeot. A sales network expansion has put Lotus on course for 2,000 deliveries in the current year ending March 31, Gales said, a 62 percent increase on the previous year but well short of a 3,500 goal for 2016-17, when it aims to return to profit. Priced at 72,000 pounds, the Evora 400 -- denoting the increased horsepower -- and a coming roadster variant are key to any comeback in the U.S., where sales have dwindled to 250 cars. Engineers changed some parts and dropped others to pare 22 kilograms (48 lbs.) from the Evora while adding a bigger supercharger -- a "power up, weight down" approach Gales plans to repeat on the Exige and entry-level Elise, starting at 34,000 pounds. The model revamps will also cut both input costs and manufacturing time by about 10 percent, he said. The board may decide this year to invest in a new four-door model, most likely an SUV, Gales said. Echoing Aston Martin, VW's Bentley and other luxury brands that are cautiously edging into fast-selling premium crossovers, he vowed that Lotus would "reinvent the category" rather than simply join it. "We'd do an SUV that is very light, very fast on the track and has outstanding handling," he said. "I'm a bit torn between an SUV and a four-door sports car -- but in the end I can see that the SUV has the bigger market."